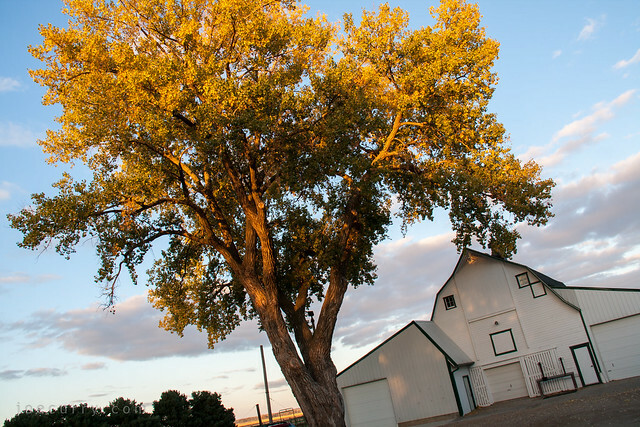 Today’s photo is deceiving because this cottonwood tree on our South Dakota farm is huge. Its shiny leaves shake and shimmer in the wind. The tree was once even bigger, and it played a large role in my childhood. You’d probably need at least two tall adults to wrap your arms around the trunk. To keep the tree healthy, 4-5 major limbs (if not more) have been trimmed over the years. It housed our bike storage shed with Huffy and Schwinn bikes, garden tools, hula hoops, Skip-It and stilts. Above the storage shed was our tree house with a ladder made from 2×4’s, and we could see the Curry Seed office and cattle yard to the north from our lookout tower. Our horse trailer was parked next to it, and we’d saddle our horses under the tree and stow afternoon snacks in our saddlebags of peanut butter sandwiches. Our first dog (that I remember, of the many, many family dogs) was buried along the fence line, and the foals born on our farm would run and kick their heels in the grassy pasture next to the tree. A tire swing hung off another branch, and as kids we’d swing so high, we’d get butterflies from the gravity rush. I’ve seen the redwood forests, and yet this cottonwood is still impressive to me and it anchors our family farm on the Midwest plains. And in many ways, it anchors many of my childhood memories.